Welcome to PTASchools.com, the top resource for finding schools with physical therapy assistant programs. We have researched the web to bring you the best assessment, information, and selection of schools as possible to help you make your decision. On our website, you will find detailed information on accredited PTA schools and programs, schools listed by state, salary and career information to help you decide if this is the right career for you, and search and comparison tools to help you find the right program for you. In the US, there are over 200 accredited programs offering PT assistant degrees that we have in our database. In addition to the accredited PTA programs, we also have related programs, including occupational therapy assisting and physical therapy degrees, among others. In all, we have over 300 schools in our database with over 330 PTA/PT/OCC/related programs. To quickly get matched to a healthcare program, check out some featured programs. To learn more about PTA programs, read on. Before you find a school and program, it is important to understand the past trend of the job you are looking at to predict future outlook. We gathered data from the Bureau of Labor Statistics on the past 5 years to understand the growth patterns. 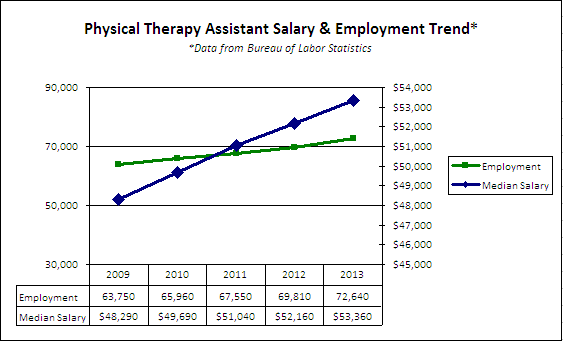 Since 2009, the median Physical Therapy Assistant salary has increased by 10%, and total employment has increased by 14%. Both are positive growth numbers, and considering the general shortage of healthcare employees, we believe the outlook is good for anyone looking to get into physical therapy assisting. If you are a more visual person, refer to the below chart displaying this data. The PTA program in general tends to be popular mainly due to healthcare demand, as well as demand for physical therapy assistants (as with healthcare in general), has been increasing over the past decade. 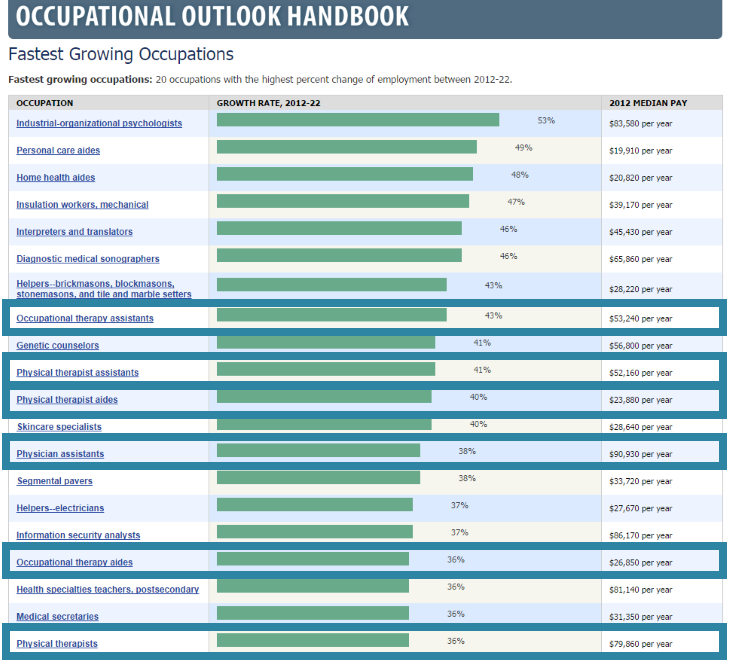 However, the Bureau of Labor Statistics and the Occupational Outlook Handbook is projecting physical therapy assisting to be one of the top 20 growing careers. We have highlighted all of the PTA and PTA-related careers in the below image from the BLS and OOH. The accredited programs lead to an associates degree and typically take 2 years to complete. The curriculum includes a wide range of fundamental and specialization subjects. There are more general-education courses, such as English, mathematics, anatomy and physiology, and psychology. However, (and more importantly), hands-on clinical training is part of every accredited program to help students get real-life experience in an actual clinical setting. Holders of PTA degrees require a license to practice in most states. There are two requirements for obtaining a license. You must have completed successfully an accredited program and you must have passed a specifically designed examination. Most states require passing of the National Physical Therapy Exam for licensure. Choose only from accredited PT assistant schools. Only individuals with physical therapy degrees from accredited educational institutions are allowed to take the National Physical Therapy Exam and obtain a license. You can find the full list of accredited physical therapy schools on the official website of the Commission on Accreditation in Physical Therapy Education (CAPTE). Evaluate the education offered by different PTA schools. Go over the curriculum to ensure that it includes subjects such as anatomy and physiology, rehabilitation methods and exercise therapies, kinesiology, neurology and psychology. Subjects like medical terminology and health care ethics are also important. You should pay special attention to the practical training. The longer and more comprehensive it is the better. Take into account the grades and employment rate of the graduating class, the training and experience of faculty, the student to faculty ratio and the schools facilities. Consider the fees of different PT schools. Traditionally, programs at community colleges cost less than those in private colleges. You should explore all available opportunities for financial aid before making a decision. There are federal and state grants, student loans and scholarships available from the different educational institutions and from various organizations. You need a high school diploma in order to get accepted into one of the accredited physical therapy assistant schools. Some of the programs are more difficult to get into as the competition is greater so it is a good idea to apply to a number of schools. In order to be competitive, you need to have taken math and science subjects in high school. Grades count as well. There are some practical aspects to consider such as location and tuition fees. The schools offering PTA programs are many and different. You can select between state and private educational institutions. You can choose to study in a large city or in a small town. There are also part-time and distance-learning programs that allow you to study while working or looking after your children. You should evaluate each program which you are considering on its own merits. One of the main factors indicating the quality of education at the respective school is the performance of graduates on the national exam. You may want to inquire about the graduate employment and the salaries graduates earn. Find out more about the training and experience of faculty and take into account the student to faculty ratio. The schools facilities are also important. Consider going for a program that offers more clinical training. There are multiple opportunities to advance from your PTA position, but most involve also furthering your education. The most common progression is for physical therapy assistants to enroll into a physical therapy program and study while also working full-time as PTA. There are other opportunities for those not interesting in a PTA position: there tend to be administrative and managerial positions and positions in education for PTAs. The mean annual physical therapy assistant salary is $53,360, according to the BLS, and is expected to increase as the past trend has, steadily along with the growth in the number of jobs throughout the country. The employment of assistants is expected to increase ~45 percent by 2020, according to the Bureau of Labor Statistics. The occupational therapy salary for assistants (related field) is $51,010. Are We Missing a Program or School? Let us know! We are a growing website solely focused on physical therapy education. If you are a school and could not find your listing, please contact us at lindsay (at) ptaschools.com!